This is clearly my biggest production to date on Amstrad CPC. It required me to write many custom command-line tools to make image conversions, data packing, SDCC/asm dynamic binding.. It was also the first time I created a production with Ced. The demo was well received, thus some found the demo a bit too short. More info about a preview of this demo can be found here in its dedicated article. Fun fact : Ced got ripped ! Looks like original Pheelone logo inspired some people. 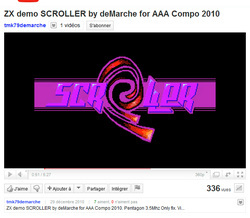 You can watch the demo here (YouTube).